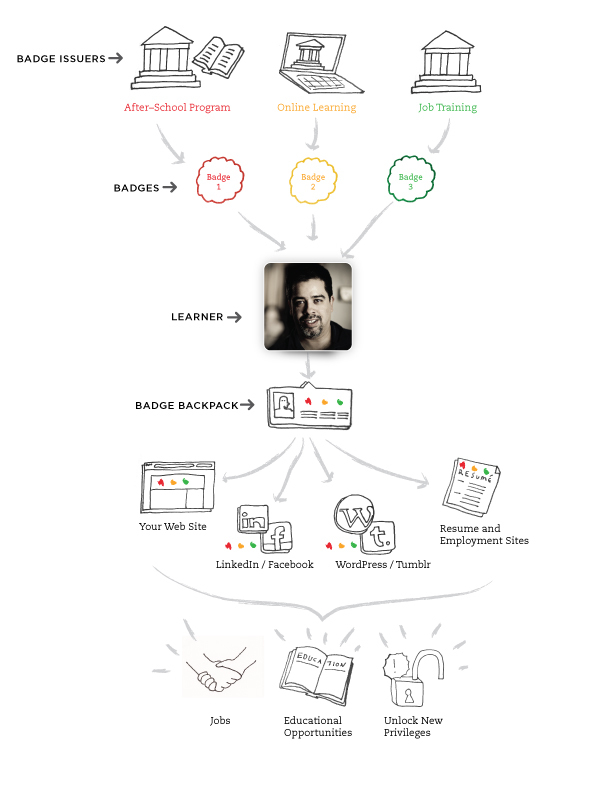 I've started my journey into Mozilla's Open Badges initiative. I'm doing this because it fits so well with my beliefs and values around open education, assessment and accreditation. It really seems like the logical next step for me and my desire to assist in opening learning for everyone; outside of the traditional institutions. Don't get me wrong, I believe people can learn amazing things at traditional institutions and people should continue to engage traditional institutions. I just also believe people should be able to get as much recognition and accreditation from their learning outside of the traditional institutions. What I really value most about the open badges initiative is that they are wanting to offer an infrastructure (and I believe the infrastructure is key) that is open to everyone and doesn't end up focusing its efforts on higher education institutions (OER based or otherwise). In Mozilla's description of their open badges initiative it is also key that they support all areas of learning. It is this that I value most. I will create curriculum for, and deepen my understanding of, Mozilla Open Badges by using my Agile Instructional Design (AID) methodology. I will focus on building OER for open badges from both the perspective of an education technologist and an independent learner. I will build this first set of resources as AID sprints with two iterations; the first focused on the edtech and the second on the learner. The first task within AID is the envisioning step. This step focuses on developing an introductory understanding of the subject and creating the beginnings of a curriculum map. This is how I will fulfill the tasks within the AID envisioning step. Here I will create a concept map of the open badges domain. This will also include a list of the keywords found within the domain. I will gather this by quickly reviewing all the Mozilla artifacts I can find on open badges and perform a few Internet searches to try and discover any gaps. I will build upon the concept map by identifying the learning themes. One of the themes that immediately jumps to mind is the focus on issuing, storing and displaying the badge. Rather than the assessment of earning the badge. There are two roles within this iteration; they are the edtech and the learner. I will elaborate on the roles in a subsequent post. Feel free to follow along (or even join in) with my learning. I'll be as open as the technology will allow and contributing will assist us both in deepening our understanding of open badges.